My family converted to solar this past fall and our only regret is that we didn’t do it sooner. As I discovered while writing this article for WhatcomTalk.com, we may have hit it at exactly the perfect time. Washington State is about to modify it’s incentives, which are not expected to be better than the existing ones, that will take affect July 1, 2016. As the article also mentions, going solar now will benefit the Bellingham Food Bank too. If you’re at all curious, check it out. Its never too late to move toward sustainability, but now seems to be the right moment. Thanks to Ecotech Solar and Itek Energy for getting my house squared away. This month I had the pleasure of becoming the proud owner of a solar system. Not an infinite universe, the renewable energy kind. I’ve wanted an array of panels since high school, the way some kids dream about a fast, shiny car or a spring break trip to Fort Lauderdale. My adorable house, a 1928 craftsman, has struggled with overheating in the warm weather since before we bought it in 1998. So I knew its perfectly-sloped, south-facing roof would be ideal for erasing my electric bill. I have to admit that I’m feeling a bit smug now that the panels are up, the way some might feel with that shiny new car in their driveway. But unlike a fancy new car, I’m hoping everyone will get to have solar someday. I’m really excited about the incentives and developments in solar and wind that help lessen our dependence on fossil fuels and the wars that go with them. My husband has also expanded his nerd repertoire. At least twice a day he lets me know how many kilowatt-hours we’ve generated, while still forgetting to turn off the dining room light when he heads to bed. Baby steps. While I was working on getting my own solar panels, I stumbled across the subject of my latest article on WhatcomTalk.com. 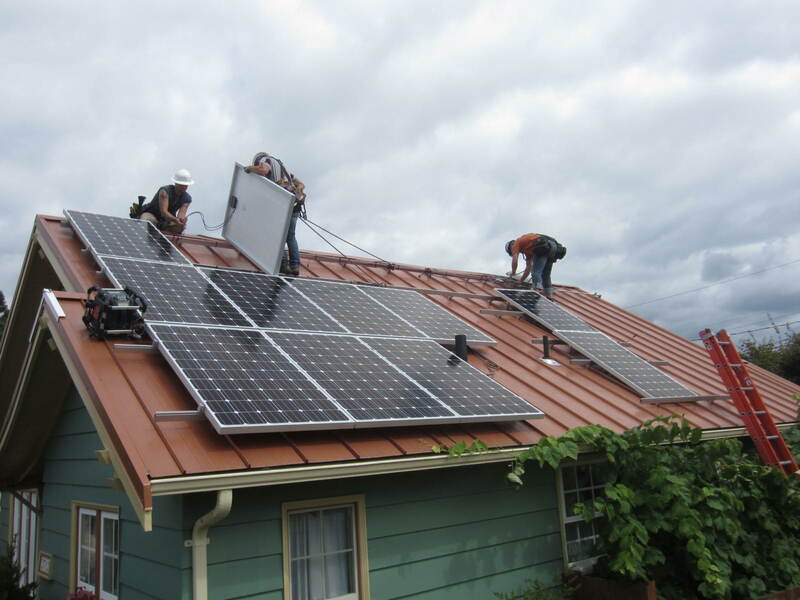 A Bellingham-based land trust, Kulshan Community Land Trust, with the help of a mysterious anonymous donor, is putting solar on many of its homes, while creating jobs and stimulating the local economy for two solar design companies, Ecotech Solar and Western Solar, as well as a panel manufacturing company, Itek Energy. If you’ve thought about jumping on the bandwagon, this is the time. One big federal incentive is set to expire in 2016. Maybe we can convince President Obama to use an executive order to extend it to 2020? Can’t hurt to send him an e-mail, right?